Fasting during the month of Ramadan is one of the most important pillars of Islam. It is a time for thoughtful reflection and total devotion to God. During this month, more than 1.5 billion Muslims all over the world abstain from especially food and drink among other things for 29 or 30 days, from dawn to dusk. At the end of each day they gather together with friends and family to break their fast which is known as Iftar. The Iftar provides nourishment in preparation for the next day of fasting. Some Muslims however do not have enough resources to ensure that they are able to break the fast with the needed nourishment. This is where wealthy and generous members of the society come in, to ensure that those who are not so privileged are able to observe this important religious duty with some ease. One of the organizations that throws open its doors to feed indigent Muslims during Ramadan is the Al – Habibiyyah Mosque. Led by Imam Fu’ad Adeyemi, the Mosque started a food bank following his 2005 U.S. International Visitor Leadership Program on “Religion and Community.” What is interesting about Al – Habibiyyah food bank is the fact that it runs year round and not only in the month of Ramadan. During this time however about six hundred men, women and children are fed daily. Americans are very familiar with food banks and other acts of volunteerism which is why the U.S. Mission Nigeria provides support to Al – Habibiyyah in this noble activity. On a selected day, mission employees and their family members also visit the mosque to participate in the distribution of food during Iftars. 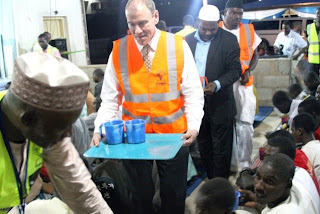 On the 16th day of Ramadan this year the volunteers were led to the mosque by the Acting Deputy chief of mission, Douglas Climan where they helped in serving cooked food to those in attendance. The host Imam Fu’ad Adeyemi; who happily received the volunteer group thanked the U.S. Embassy saying that; “you will not know but there are so many people who were interested in doing what you did but they are afraid.” He expressed the hope that the relationship between the Embassy and Al- Habibiyyah Mosque will continue to grow.